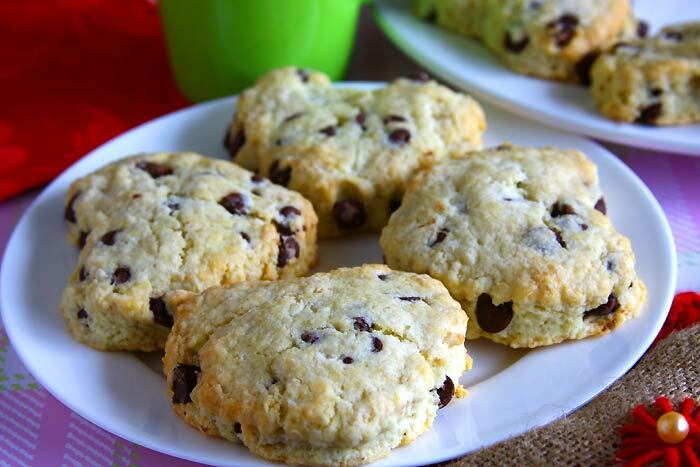 Chocolate Chip Scones: Few days back I was cleaning my bookshelf and I found a huge bunch of papers in a file. All were recipes that I had photocopied from various cookbooks I had borrowed from the library a couple of years back. I had completely forgotten that it existed. All these I had done were in the pre-Pinterest era I guess. These days I just browse for recipe ideas in Pinterest or in some of my favorite recipe sites and I had no idea about these recipe photocopies. While going through those papers the vegan chocolate chip scone recipe from The Joy of Vegan Baking caught my attention. I wanted to bake something quick because my son’s friend was coming home and wanted to surprise him. I hadn’t put butter in the counter for it to be soft enough to cream it with sugar like most of the recipes would call for. 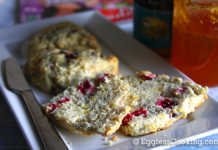 I knew that I had to do something with cold butter and so baking eggless scones would be the best option for that. As much as I wanted to try the vegan version of the chocolate chip scone to see how it turns out I couldn’t bake it because I didn’t have vegan butter alternative in hand. 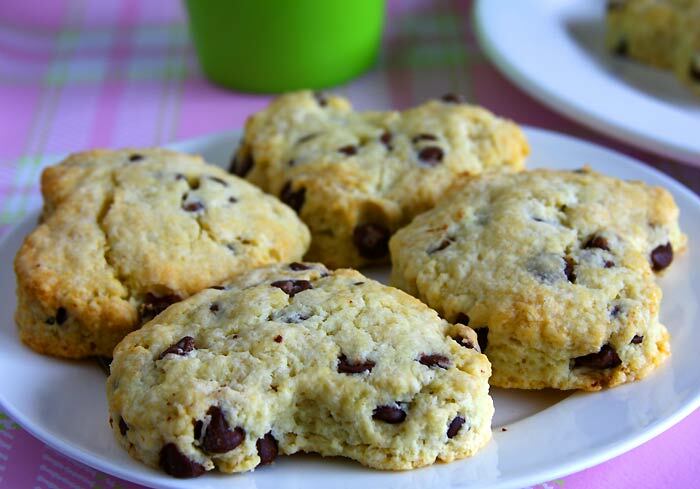 So I had to make eggless chocolate chip scones using butter. 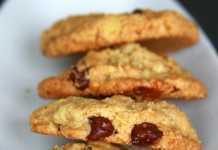 I had all the other ingredients readily available and in general scone recipes can be put together quickly and so I was ready to go. Having a pastry blender make it easy to cut in the butter into the dough. Also care should be taken so as to not to over mix the dough otherwise you will end up with tough scones. Fortunately I ended up with rich and flaky chocolate chip scones without eggs. 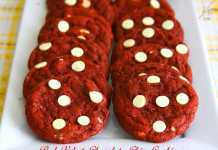 If you are weird like my husband and so not a fan of chocolate chips, you can add raisins, dried cranberries and any other optional add-ins of your choice. 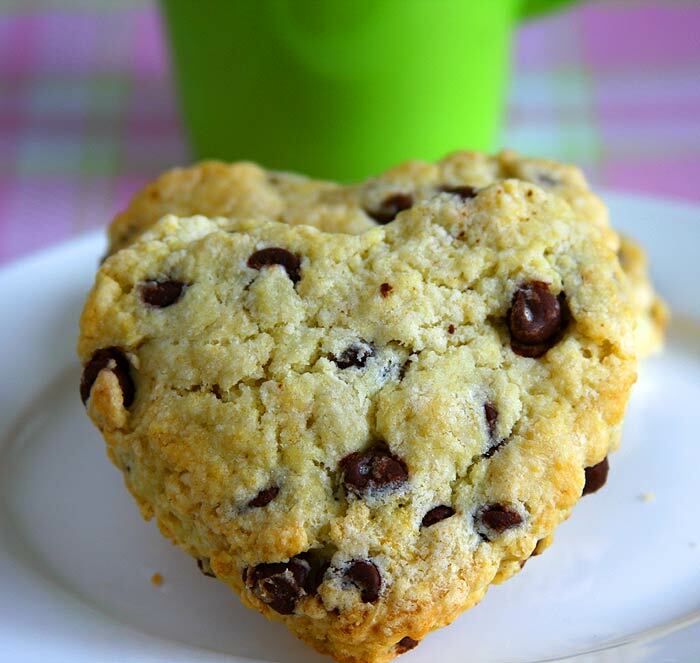 Surprise your loved ones with these heart shaped chocolate chip scones for breakfast on Valentine’s Day! Preheat oven to 425F/220C. Lightly grease a baking sheet with non-stick cooking spray or line it with a parchment paper. In a small bowl whisk together the Ener-G egg replacer and water and set aside. In a large bowl, combine together the flour, sugar, baking powder and salt. Add the butter to the flour mix and cut it into pieces with a fork or pastry blender. Do not try to make it smooth but work towards making it a coarse and crumbly mixture that looks like bread crumbs. It is not necessary that all the butter should be mashed. You can leave some big pieces as large as peas to yield flaky scones. Stir in the chocolate chips or other optional add ons like dried cranberries, raisins etc. Now add the milk and egg replacer mixture and keep mixing but do not over mix which will develop gluten in the flour and will produce tough scones. Mix with a wooden spoon or just your fingers until the wet and dry ingredients are moistened. The dough will not be smooth and it’s ok.
Make the dough into a ball. For this you may need to add just a few drops of milk or water. Lightly flour a large cutting board or a clean kitchen counter and place the dough on that. Pat the dough to a 1/2 inch thick circle and cut into 8-10 pieces or use a heart shape cookie cutter to cut out heart shaped scones. Re-roll the dough to cut as many hearts as possible. Place them 1/2 inch apart on the baking sheet and brush it with some milk and sprinkle with some cinnamon and sugar if preferred. Bake until the tops are golden brown, 12-15 minutes. Let cool on a rack and it’s better served warm. I cut the butter into medium sized cubes before cutting it with the flour and it was quite difficult to break it all down. 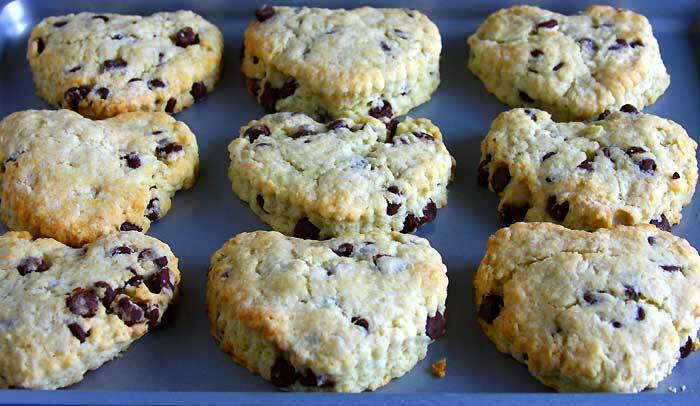 Only after I made these no egg chocolate chip scones I read in a website to grate the cold butter so that working with it will be easy on your hands. What a lovely idea! I can’t wait to make my next batch of scones just to follow this tip. 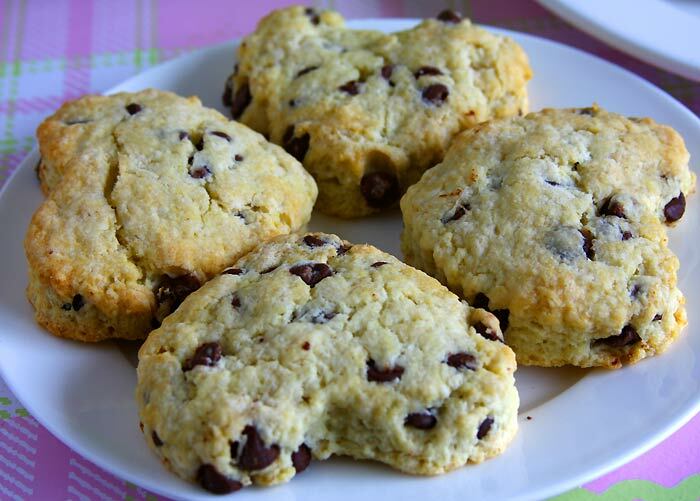 Ener-G egg replacer is used to substitute one egg in this chocolate chip scone recipe.